The Handbook of Eyewitness Psychology presents a survey of research and legal opinions from international experts on the rapidly expanding scientific literature addressing the accuracy and limitations of eyewitnesses as a source of evidence for the courts. For the first time, extensive reviews of factors influencing witnesses of all ages-children, adults, and the elderly-are compiled in a single pair of volumes. The disparate research currently being conducted in eyewitness memory in psychology, criminal justice, and legal studies is coherently presented in this work. Controversial topics such as the use of hypnosis, false and recovered memories, the impact of stress, and the accuracy of psychologically impaired witnesses are expertly examined. Leading eyewitness researchers also discuss the subjects of conversational memory, alibi evidence, witness credibility, facial memory, earwitness testimony, lineup theory, and expert testimony. The impact of witness testimony in court is considered, and each volume concludes with a legal commentary chapter. 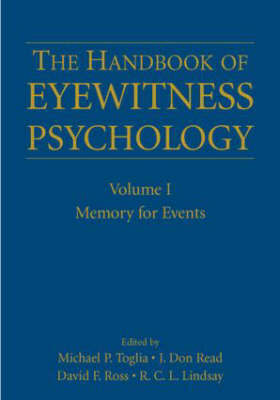 The Handbook of Eyewitness Psychology is an invaluable aid to researchers, legal scholars, and practicing lawyers who need access to the most recent research in the field, accompanied by the interpretations and commentary of many of the world's leading authorities on these topics.